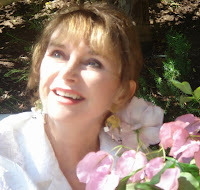 Thanks for joining me here today on Christina’s Bookshelf to talk about Under a Blue Moon, book 2 in the Camp H.O.W.L. series. I’m having a blast promoting it, because the Camp H.O.W.L. series is so much fun to write. I’ve always had an interest in reading paranormal romance and urban fantasy, but I never thought I’d write a werewolf series. To be honest, the world building always seemed so daunting. When I got the idea to set a werewolf camp deep in the Hoosier National Forest, I had the chance to create my own werewolf mythology. Pretty much everyone we met in the first book was a werewolf. But even though they’re hidden, werewolves aren’t insular. They live among humans and have to find a way to fit in–that’s pretty much the entire purpose of Camp H.O.W.L. Without that training, new wolflings would probably be all over social media flashing fang! Dealing with a human who’s in the know was a whole different challenge, which is why I loved writing Drew so much. He grew up in a Pack, since his mother married into one when he was young. He’s always known his human limitations, but he’s never viewed himself as less capable. There are, of course, times he’s not going to be able to keep up. I’ve got an excerpt up on Love Bytes today that’s the perfect example of that. Turns out a human isn’t great a werewolf parkour–go figure. In Under a Blue Moon, Nick and Drew have obstacles to their happy ending because of Drew’s humanity. Nick worries that part of himself would always be inaccessible to Drew since Drew doesn’t know what it’s like to have an inner wolf. It was a fun twist on the usual trope of the human being afraid of the Were–here, Nick’s afraid of a relationship with the human because he feels like they’re too different to be able to really communicate. Even though Drew might not be able to hold his own in a werewolf parkour class, he’s more than up to the challenge of convincing a stubborn werewolf that he’s being short-sighted. Drew may be one of the most badass people at Camp H.O.W.L., and he’s entirely human. It just goes to show that even if you lack an inner wolf, it doesn’t mean you don’t have an inner fire. Visit Bru online at www.bru-baker.comor follow her on Facebookor Twitter. Bru Baker writes sophisticated gay romantic fiction with strong characters, real-world problems, and plenty of humor. She’s a former journalist who now balances her time between writing and working as a librarian. Whether it’s creating her own characters or getting caught up in someone else’s, there’s no denying that Bru is happiest when she’s engrossed in a story. She and her husband have two children, which means a lot of her books get written from the sidelines of various sports practices. Werewolves are supposed to make the change during puberty. It seems that the gods didn’t get Adrian’s coming of age memo and forgot about his change. Now he’s in his twenties, still a member of the pack, but human. He’s across the country for business, a pack run business, when he falls ill. He doesn’t believe it to be anything serious although the signs are pointing otherwise. Until he finds himself in the hospital. Dr. Tate Lewis works at Camp H.O.W.L. A prestigious camp that caters to weres coming of age. They help with the physical aspect of the transition but also social, mental, emotional, and spiritual as well. Tate didn’t have such a luxury when he changed. The ways of his pack were barbaric. He finds solace in his work. When Tate sees that the new camper is much older, more wise, and put together than what he’s used to he sort of scampers away. He’ll do what he must from a professional stand point, but no more. Only fate doesn’t listen to Tate’s pleas. Destiny has already been decided for him and Adrian. Now they must follow the path. “Thank you for the courage.” She chuckled again. Shame she was a blatant enemy. He kind of liked her. A tapping against a glass brought the whole crowd around to face the center of the dance floor. All the guests who were sitting stood and placed a hand over their heart. Rome didn’t even have to ask. He turned to find Gerard Havilland weaving drunkenly between his sister, a pale, delicate-for-a-wolf female, and some male named Alphonse who Rome had heard was Havilland’s second. Nobody spoke about Havilland’s wife, who’d apparently walked out on him years before. Rome sighed quietly and crossed his heart. Yeah, and his fingers. As the voices died down, Rome felt all his hair standing on end. Regardless of how unworthy the alpha, the pledge rang with the truth of ages and united every were. Havilland waved his hand impatiently toward the crowd. 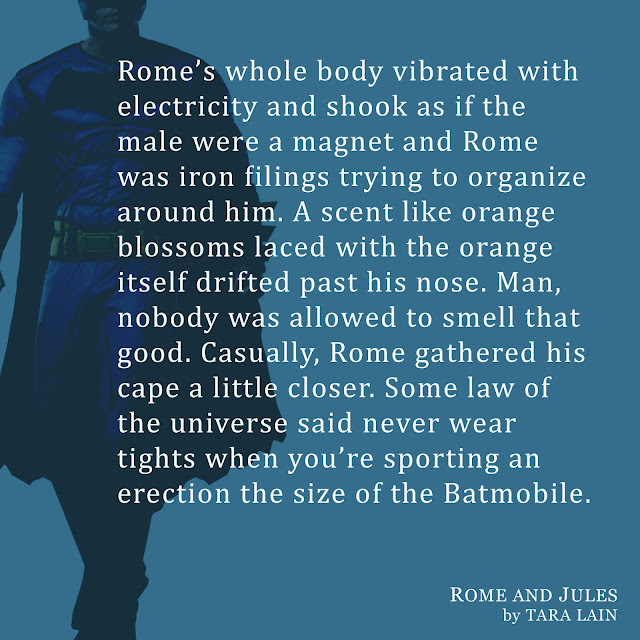 Rome turned his head—felt his mouth fall open—and let his body follow the turn. Oh my god of wolves. From the side of the big room walked a young male who could only be the much-heralded son. What was his name? Who cares? The guy was tall—taller even than Rome—reed slender, with dark blond hair that likely fell to his shoulders if released from the queue gathered at his neck in a ribbon. But the face. Like someone translated poetry into a person. 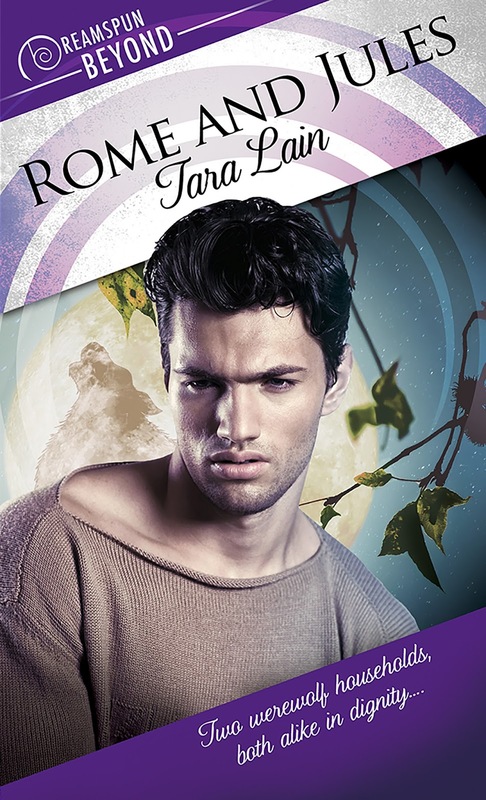 Large eyes, so blue Rome could see their color from where he stood, dominated his face above high cheekbones that would have been gaunt if they weren’t a soft, glowing pink. His neck was long, his hands graceful. Gods, what is he? Wolf males might be tall like Rome, but they were nearly always powerfully built. This guy looked very little like Gerard Havilland. Rome’s whole body vibrated with electricity and shook as if the male were a magnet and Rome was iron filings trying to organize around him. Hi. Welcome. I’m Tara Lain and I’m delighted to be here to celebrate the release of my newest paranormal romance, Rome and Jules. As the titles implies, the book incorporates the Romeo and Juliet trope – and the decision to do that all started with the line you see above – the first line of Shakespeare’s play – with a little addition. LOL. Somehow, I thought the line had a great ring. Of course, my Romeo has to go to a masquerade party chasing someone else and sees the beautiful Jules who’s about to be married off for money by his drunken father. 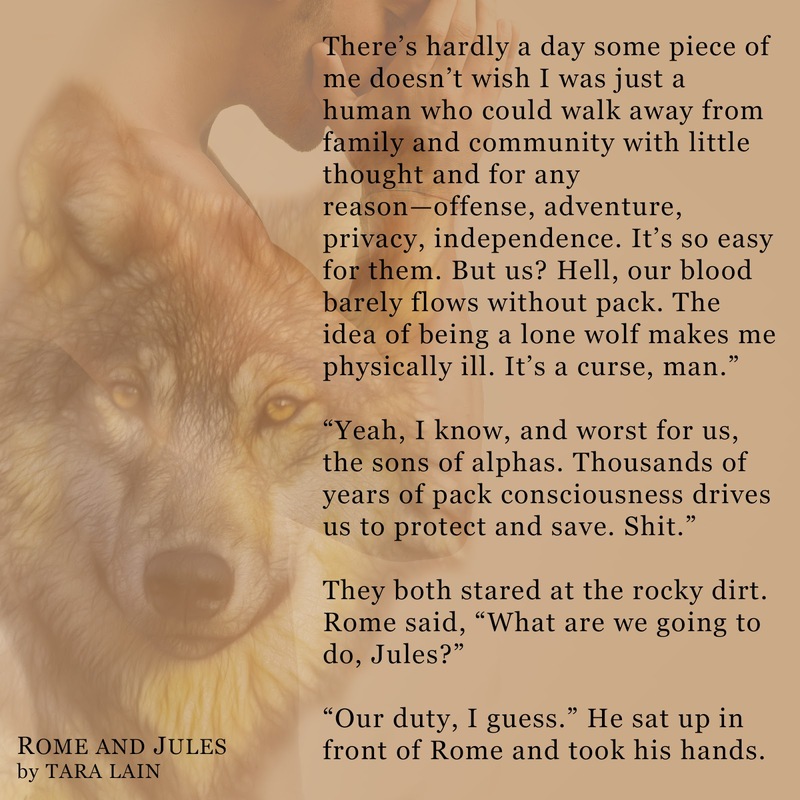 Rome desperately wants to help Jules – and desperately wants Jules. The plot definitely thickens.